A lost-and-found cat from Victoria, Australia, is making headlines today for being an unlikely train commuter. When Rupert, a 2-year-old fluffy orange house cat, ran away from his West Melbourne home on February 18, his owner, Bec Gilchrist, was devastated. “He ran out the back door one night when mum was taking the rubbish out, and that was the last we saw of him,” Gilchrist tells Australia’s ABC News. Gilchrist rescued Rupert when he was just a kitten, feeding him by hand and giving him the care he needed after someone had abandoned him in a garbage bin. Over the years together, Rupert had grown into a healthy cat, but he was often quite nervous around unfamiliar people. Because Rupert was usually content to hang around the house, Gilchrist was surprised when her cat darted out of the door. Now, without Rupert, her house just didn’t seem like home anymore. 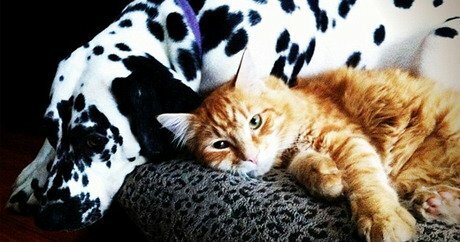 Worried for Rupert, Gilchrist made “Missing Cat” fliers, passing them out to neighbors and hanging them up around town. But three months passed with no word on Rupert’s whereabouts. But then, last Tuesday, Gilchrist got the call she’d been waiting for — Rupert had been found and was currently safe at an animal shelter. The news surprised and delighted the worried cat owner so much she says she nearly ran off the road. “I was driving when they called me and luckily I’ve got Bluetooth,” Gilchrist remembers. The shelter worker explained they were able to catch Rupert and scan him for a microchip. They said they were pleased to discover the orange cat did in fact have a chip, and that the chip was associated with Gilchrist’s contact information. Then Gilchrist learned where Rupert had been wandering when he was found. The crafty kitty was finally caught in the city of Traralgon, which means Rupert had somehow wandered 165 kilometers (that’s roughly 102.5 miles) from home. That’s easily a two-hour drive from West Melbourne, Gilchrist explains. She had no clue how her little cat had managed to stray so far. That’s when the shelter worker suggested that Rupert had perhaps boarded a slow-moving paper-mill train that runs through both West Melbourne and Traralgon. The theory seemed to make a lot of sense. Gilchrist tells the Daily Mail that one member of her family seemed to have an idea where little Rupert might have gone — the family dog, a Dalmatian named Poppy. Whenever Gilchrist and Poppy would set out for a walk, Poppy would always pull her towards the train tracks near their home. Gilchrist made the journey down to the shelter to claim her missing cat. Rupert was in good shape despite being on the lam for months, though he did lose a bit of weight. While everyone is thrilled to welcome Rupert home, perhaps no one is as excited to see the little orange cat than Poppy. Gilchrist says she is happy to have Rupert back and ruling the roost. “My dog had been fretting and reverting to puppy behavior but now the cat is back he is relaxed. And Rupert is a bit friendlier now,” she tells The Sydney Morning Herald.